It was on July 4, 1939, Lou Gehrig Appreciation Day, when the longtime Yankee first baseman uttered the famous words at a home plate ceremony at Yankee Stadium: “For the past two weeks you have been reading about a bad break. Yet today I consider myself the luckiest man on the face of the earth.”. This photo documents that historic day and moment in baseball history. 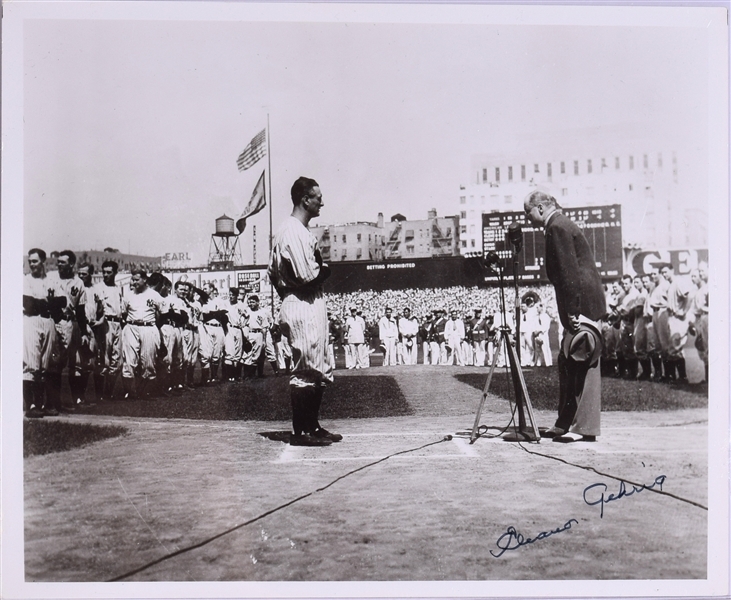 Th only photo believed signed by Gehrig from this day sold for over $100,000 . This photo a later generation signed by his wife with JSA certification is also quit scarce. We could not find other examples. It is interesting to note soon after the day in 1939, Gehrig's wife did almost all of the signatures for Lou, due to his sickness.